"My grandmother had a word for those kinds of guys, nice guys, old-fashioned guys. The kind of guys who wear sock garters. Guys who get hay fever and like raking leaves. The kind of guy you settle for because you can't be with the one you love. She called them 'Baxters.' Well, I'm a Baxter." Michael Showalter is a little-known comedian even though he is responsible for some of the funniest projects in the last 15 years. Showalter originally came on the scene via the short-lived MTV series, The State. Much of the cast of that under-appreciated sketch show reunited for the 2001 film Wet Hot American Summer, and Showalter continues to appear with members of that tight-knit group in the current Comedy Central series, Stella. 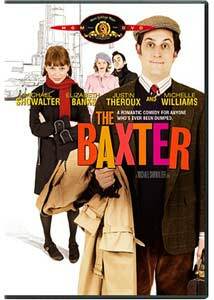 The Baxter is Showalter's feature directorial debut, a funny, lighthearted comedy that will hopefully generate the attention this talented comedian so richly deserves. Elliot Sherman (Showalter) had been dubbed a "Baxter" by his grandmother. According to Grandma, a "Baxter" is a nice guy who is seemingly on Earth to be pushed around by women who settle for them when they can't find true love. Elliot is engaged to the beautiful Caroline (Elizabeth Banks), and he is beginning to think that he might not be a Baxter after all. Everything changes when Caroline's old flame, Bradley (Justin Theroux), pops up unexpectedly, and Elliot realizes that their love is rekindling right before his eyes. Elliot soon meets a mousy temp worker named Cecil (Michelle Williams) who has similar problems with her love life and just might be the friend that this Baxter needs. While this sounds like a pretty standard , straightforward comedy, it's a great, touching take on what rejection can do to a person. The story never gets overly sentimental, but there's just enough touching moments to make the comedic material that much more poignant. This mix could make this surprising picture a surprise hit on DVD. Michael Ian Black and David Wain of Stellamake brief but very funny appearances. Black does such an amazing job creating physical comedy by simply looking goofy, and the outfits he wears here hammer it home. Wain is a genius at dialogue delivery, and his talk with Showalter after Elizabeth Banks' character basically dumps him is hilariously confusing, but unforgettable. The Baxter also marks the first time I've seen Michelle Williams in what amounts to a leading role in quite some time, and there is something about her presence on film that makes it difficult to take your eyes off of her. She's not drop-dead gorgeous in a supermodel way, but she has such a uniquely cute girl-next-door look to her that sets her apart from other young actresses of today. Williams steals every scene she's in, and her character is the perfect compliment to Showalter's Elliot. Peter Dinklage also has a bit part as a homosexual wedding coordinator. He only has a few juicy minutes of screen time, and he makes every second worth our while. Dinklage, a character actor, has really made a splash on the indie fcircuit in the last five years, and his work here is equivalent to what he accomplishes in The Station Agent. Showalter has a very unique sense of humor, one the masses have not quite latched onto, a least here in the states. In The Baxter, Showalter, Black, and Wain make their comedy a bit more mainstream, without compromising so much as to alienate their fans. Watching them pull this off is a great sign of hope that there will be more projects from them like this in the near future. Image Transfer Review: The Baxter shows up in a 1.85:1 anamorphic widescreen presentation that is nearly flawless. This isn't a flashy film, but it is a very bright one, and the color rendering goes a long way towards presenting the film the way it was intended to look. Shadow levels handled well, while black levels and contrast are just right. You'd be hard pressed to find any distracting grain or dirt, but a couple of specks do pop up. Audio Transfer Review: The audio is Dolby Digital 5.1, and it's a pretty typical comedy track, with most of the activity up front. There are some nice music cues (including Rufus Wainwright's song, Beautiful Child) that make it to the rear speakers, but this mix does what it's called on to do. Blooper Reel - Four clips of outtakes. Extras Review: The only extras offered are some trailers and a far-too-brief blooper reel that has four clips lasting for just over a minute. Fans of Stella and The State simply have to give The Baxter a look on MGM's new DVD. This is a great little comedy showcasing the talents of Showalter and company, one that warrants repeat viewings. The audio and video are well done, but a more robust extras collection would have been a plus.